The hagiographies of Catholic saints provide an insightful and useful blueprint to dissecting the populistic veneration of political figures when their historiographies get the revisionist treatment. However, potential Catholic saints are scrutinized on the merits of their wonders before their canonization as a bona fide Saint. If the Pontiff is swayed by the empirically fuzzy proof then the dead person enters an undefined period of beatification. The beatification marks a cooling off period whereby more “proofs” of exceptional earthly divinity are gathered and filed away. Once enough evidence has been amassed the reigning Pope can cast off the beatification and officially canonize the Saint “in waiting”. A frighteningly similar methodology is employed by populist movements when they embark on canonizing a political figure of some historical distinction. Every school child in America has been taught ad nauseum about the wonders of George Washington's unflappable boyhood ethics. The tale of him morally squelched and unable to lie about taking an axe to his father's cherry tree. That fanciful parable of innate American ethics embodied in a cultural hero is tantamount to the unverifiable deeds attributed to Catholic “pre-saints” during their beatification. Catholic saints are believed to fly about, to have stigmata's, heal the infirm and occasionally imbue their clothing with mystical holy powers. Their place of birth and/or death are transformed by the believers into shrines of devotion. These shrines are the locale where yearly pilgrimages terminate and relics are bought and placed to insure the sanctity of the pilgrim and the shrine. Take for instance the historical ramifications of the wooden dentures which George Washington wore for the first time on the battle field at his victory at Valley Forge. Or perhaps more mundane the jute suit which Ronald Reagan wore on the night he lost his virginity. These are intrinsically no different from the Catholic prerequisites to canonization. I will attempt to analogize between a famous political “pre-saint” and her road to beatification and the sub rosa attempts to start a beatification process for current American politicians. In order to make the comparison we first must define what is a relic entails. The word relic found it's widespread usage in the English language during the early 13th century. The shift in meaning in the 13th century lent itself to referring to a particular body part or other artifact associated with a holy person. Initially the Latin word reliquiæ was used to refer to mementos of pious men and women. The root word is linquere meaning to leave or depart which was coupled with “re-” as a form of “back” giving us reliquiae; something endowed to us from a saint. Of course, relics come in various degrees of piety and super powers. Generally speaking there are three categories of relics in ascending order provide insight into the inherent powers they embody. The hierarchy of piety corresponds neatly with the particular cultural, social or political impasse which the relics are employed to help overcome. Bottom of the totem pole (excuse the pun) are classified as “third degree” relics which are items or objects which in some fashion were touched by the saint. Second degree relics are held in higher esteem because they were those used and or worn by the saint. Apparently the second degree relics have had more time to absorb the saints divine vibrations. The holiest of holies in the realm of relics are also the rarest of relics. First degree relics are the incarnation of the faith which function as touchstones of that faith among believers. Examples of first degree relics are slivers of the true cross, anything from Jesus or any generic body part from saints. During the early middle ages through the late middle ages in Europe a whole subversive thieving industry arose (furta sacra), to supply the enormous demand for holy relics. The fact that Jesus' foreskin, The Holy Prepuse, was claimed by as many as 18 different churches throughout Europe during the middle ages, doesn't negate the fact that this was a magnificently holy relic rivaled by no other. Naturally, if the first written documentation of The Holy Prepuse is of Charlemagne bestowing it upon Pope Leo III, then the currency of it's innate super power increases exponentially. Although Charlemagne exemplifies a person having the acumen of realizing the political value of a relic, he was never canonized. A saint who also understood the political importance of relics and miracles was Saint Catherine of Siena. Curiously and perhaps ironically extreme piety was one of the few avenues in which women could garner as much acclaim as men in the political arena of church affairs. Women were barred from holding posts in the hierarchy of the Roman Catholic Church but little held them back from veneration as conduits of divine propriety. 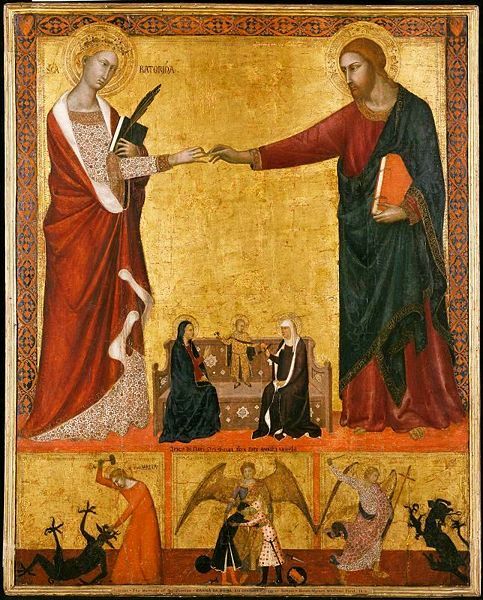 Catherine of Siena might be diagnosed today as labile and paranoid schizophrenic but in 14th century Italy she was viewed as being divinely blessed with visions. We'll ignore the fact that she perpetually hallucinated because of her staple diet of Holy Hosts and consecrated wine; taking communion every single day. Catherine of Siena made the holiest of vows only to be broken later in adulthood for an even holier vow. At the age of 7 she purportedly took the vow of chastity and abstinence as a result of her first ecstatic vision she had of Christ. When she had reached adulthood she upped the ante on her piety and announced that she had entered into a holy union with Jesus; she wed the Son of God. Bold and brash as it may seem that singular act erected a bulwark against criticism from the male dominated Church authorities. Catherine was on her way to adopting a trifecta of ecclesiastical notoriety when the rumors of her stigmata accelerated to a fever pitch. Those three attributes (marriage to Christ, divinely inspired hallucinations and stigmata) would catapult her into the frays of perhaps the biggest power struggle to date within the Roman Catholic Church. The Western schism, which divided the papacy from 1378 through 1417, had two simultaneous Popes: one in Italy and one in France. The division was more about political discordance than any profound theological dispute. Catherine wrote extensively to both Popes, notably Pope Gregory XI. He was so enamored with her eloquent piety that he followed her heavenly instructions and returned his administration to Rome for the remainder of his Papacy. During the rest of her lifetime Catherine lived in Rome where she, under the protection of Pope Urban VI, lamented about her failed struggle to end the Schism. She died in Rome at the age of 33; a number which has immense religious currency within the Christian faith. My assertion is that the Church needed her and the people needed her which led to the unconscious manufacture of an exemplar of extraordinary divinity. It is irrelevant to apply any scientific litmus test in order to discern whether or not Catherine of Siena was indeed telling the truth. Whether she was neurologically, psychologically, or physiologically “normal” can't negate the perception of her contemporaries and their necessity to believe. Catherine was eventually buried in Rome. A list of miracles and wonders claiming to have happened there is testament to both her popularity among the lay members of the Catholic Church and the savvy clergy who recognized the political potential of her relics. Steadily her popularity transcended a mere holy man and the Pope was forced to move her body and it's relics inside the Basilica of Santa Maria sopra Minerva where most of her body resides today. However, her body; her relic was a hotly fought over commodity. It appears that the city of Siena also wanted a piece of the relic action. A macabre story of furta sacra ensues. A band of thieves at the behest of the city of Siena crept into the Basilica and exhumed Catherine's body. The shrewd thieves quickly realized that transporting the entire body would be a herculean task; the journey remaining undetected would be to risky. They need to travel less encumbered. The macabre conclusion arrived at by the thieves was to ignominiously lop off her head and return the first degree relic to Siena. As soon as Catherine's skull was placed in a sack the thieves set out on their trek back to Siena. Of course a hero' tale isn't complete without a challenge. A challenge which is really a test of the hero's moral constitution when his confronted with impending failure. Furta Sacra heroic stories are rife with seemingly contradictory feats of moral and ethical fortitude. As the hagiography informs us the thieves were stopped by guards as they were leaving Rome. The guards demanded to see the contents of the sack whereupon the thieves began to pray to Catherine for a miracle. When the thieves opened the sack and revealed the contents to the guards Catherine of Siena had performed the miracle of disappearance. The guards examined the sack but saw nothing; Catherine's skull relic had vanished. It wasn't until the thieves arrived in Siena that Catherine's head reappeared in the sack. It's clear that the need to have control not only of the physical relic but also to to be able to dictate the hagiography of the saint is what gave the relic meaning and it's cultural brevity. The same can be said about the burgeoning historiographies of political figures. The locales of the outhouses Abe Lincoln purportedly visited or used is of much less importance than the bullet which killed him or the stovepipe hat her wore. It's the perception and not the quantifiable evidence which starts the political figure's populistic beatification. Can we observe the fledgling beatifications of political figures operating in the current public arena? That is a question with a very slippery slope. However, let's take a stab at the 2012 Presidential election candidates and their potential relics. Eventually Obama's long-form birth certificate will be auctioned off and probably fall into the hands of the Trump dynasty. Or maybe the White House establishes a lucrative cottage industry which sells certified copies of Obama's long form birth certificate. “What about Romney?”; you might ask. When Romney departs this world for the distant Mormon planet of Kolob he will bequeath his “magical underwear” to this mortal planet. We can all imagine the pandemonium it would unleash as different factions claim sacred rights to his undergarments. Who will prevail? Michigan, Utah or Massachusetts? Undoubtedly the Church of Later Day Saints in collaboration with the future Mitt Romney Institute will fabricate enough replica undies to supply the burgeoning demand.